Mali is quite an attractive country for investments in voice traffic termination VoIP business. A high rate (from 17 to 20 cents) and a well-developed mobile sector open up wide opportunities to make money on converting VoIP signal to GSM. Since the terminator obtains a profit in the form of a difference in the cost of international and local calls, you should choose the most favorable tariff plan provided by a large mobile operator. 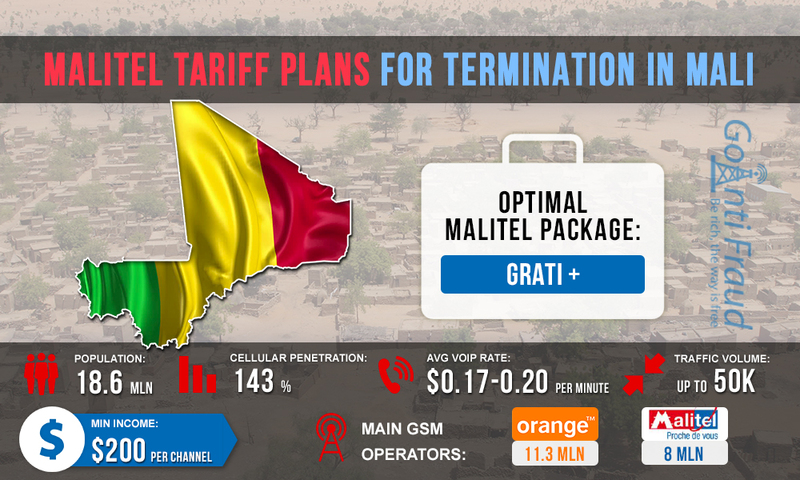 In Mali, there are two cellular operators with impressive subscriber bases: Orange and Malitel. The latter is owned by the national telecommunications company Sotelma. Its services are used by about 8 million people. Malitel has quite favorable offers for prepaid subscribers. Grati + for $0.34. 5 bonus minutes are granted. Grati + for $0.86. 15 bonus minutes are granted. Grati + for $1.72. 40 bonus minutes are granted. For VoIP termination, the best option is Grati + that provides 40 bonus minutes. Using it, one minute will cost $0.04. The average rate for Malitel traffic is 20 cents. Terminating 40 minutes per day via Grati +, the terminator can make $100 per channel, including the cost of SIM cards. If you have more active channels operating, you can increase your profits.